Cat’s paws are vulnerable part from cat which have important function for cat’s walking, balance, and also act as shock absorbents from falling. 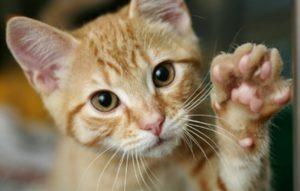 Cat’s paws are sensitive, they contain many nerve ends which make the paws great sensory organ that can aids the cat to go hunting and sense its environment. Cat’s paws are regularly exposed to many threat such as dirt, or other dangerous things or substances. Any issue in cat’s paws will definitely affecting cat’s mobility. There are many medical issues that affect cat’s paws, from simple infection to more severe disease such as cancer. The causes of them can be varied from trauma, infection, to immune disorder. Cat may give some signs if there is any issue with its paws such as limping, excessive licking, or the presence of lesion or bleeding in the paws. The sign can come from light to more severe cases. Here we are going to talk about 4 medical issues that affect cat’s paws. The first of 4 medical issues that affect cat’s paws is plasma cell pododermatitis, also called pillow foot. It is a condition of severe inflammation on cat’s paws. It occurs when cat’s white blood cells called lymphocytes, which function are to produces antibody, are overproduced. The antibodies then attack the healthy tissue of paws, causing it to swell. The exact cause of it is still unknown, many believed that the virus is the one to cause it. The symptoms include swelling and puffy paw pads, change of paw pad color to purple, ulcer, lameness, splitting, excessive licking, pain and bleeding of the paws. It is usually affect all the paws and rarely affect only one paw. The cat with this issue usually given the antibiotic and steroids medications such as antibiotic doxycycline and prednisone. This condition still doesn’t have exact cure and can put a cat into remission, but manageable. Surgical removal can be required if there is a formation of ulcer. The procedure will be done under general anesthesia. After the treatment, cat owner may still need to have follow up care and appointments with the vet, especially if the cat undergone the surgery procedure. Special attention has to be given to make sure that there is no infection developed during healing process. It is also important for the cat owner to keep the cat’s environment clean. The issue usually manageable and cat can go to live a normal life after that. Another disease that can affect cat’s paws is eosinophilic granuloma, also known as lick granuloma. It occurs when the eosinophil type of white blood cell causes the body to response infection in a wrong way. Eosinophil is one of body’s defense system to battle infection, such as foreign materials from outside the body. In this condition, the body response to trigger the defense mechanism that leads to attacking its own collagen. The cause of it are allergies to food or any environment material such as dust, fleas, or other parasites. It can happen in many part of cat’s body such as mouth or throat, chin, abdomen, legs, or paw pads. When the paw pads are affected, the cat will develop lump which turn to be ulcer when the cat start to walk on them. Unlike the pillow foot, it is usually only affect one paw. It can also cause hair loss and lesions. The condition usually self-limiting, but cortisone may be prescribed if the condition doesn’t clear up. The most important thing for its treatment is to know and remove the source of allergy. The allergy can come from many things, even from cat’s belongings, so it is recommended to buy free of allergens cat’s belongings such as foods and toys. Cat owner can also start to give the cat healthy organic raw food and any supplement. We also need always keep the cat’s environment healthy and check if there is any mold, dust and other possibly allergens. The third of 4 medical issues that affect cat’s paws is pemphigus. Pemphigus is an autoimmune disorder which is usually showed by crusts and ulceration all over the cat’s body part. The process of it begin when the cat’s defense systems start to attack its own body and attacking healthy tissues and cells. It can be fatal if it is not treated. It is not limited to paws and other body part, but can also attack cat’s gums. There are 3 types of pemphigus, pemphigus foliaceus, pemphigus erythematosus, and pemphigus vulgaris. Symptoms of pemphigus include paw pad overgrowth and crack, fluid-filled cysts in the skin, swollen lymph nodes, crusts, pustules, fever and loss of appetite. The cat may need to be hospitalized in severe cases. The medications usually include steroids which is given temporarily to relief the condition into remission. Steroids must be given under the vet’s control, as it can weaken cat’s self-heal ability if used long term. The cat may also need to have follow up visits to the vet to monitor its progress. There are many types of cat’s cancer, one of it is squamous cell carcinoma. Squamous cell carcinoma can develop on many parts of cat’s body, including cat’s paw. It is a malignant but have a slow progress. Symptoms of paw cancer are sore or bleeding ulcer on the paw, limping, cat’s reluctance to move, or nodule or papule on the paw which usually getting bigger over the time. There are many causes of it and it is usually needs to be surgically removed. The treatment of cat’s cancer needed to be done extensively by the vet with the help and support from cat’s owner. So that are the 4 medical issues that affect cat’s paws. As the issues can cause huge damage and pain for cat, it is important for cat owner to recognize the signs and symptoms of any paws disease early, so cat can be given proper diagnosis and treatment. It is also important for every cat owner to have regular examination of cat paws. Massage the paws and check every corner of it, check if there is any lump, swelling or any other injury. And remember to always give love to the cats as a happy cat can has a good effect for its health and better immune system.